Walking up the dense forest at midnight with 3 sweet local guys and 2 friends from Delhi, I had no idea what to expect. I could see nothing except the winding path through thick forest; just that much that was shown by the torch and a dog crossing my path time and again who accompanied us on the whole trek. Dark night, twinkling stars, deep forest, fireflies and the only sound I could hear was of our footsteps... quite mysterious it was! 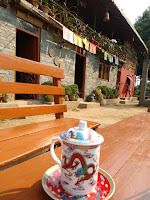 After a 3km uphill trek, it was a delight to reach the home-stay. It was much more cozy, beautiful, well constructed and well managed than I expected. Hot meal waiting for us at midnight was cherry on the cake. I opened my eyes to a completely different world with the view of dense forest and a lake from the window of my room. It was a lovely morning. I went out to veranda and sat there enjoying the sounds and smell of the forest when a little girl came with a huge cup of famous temi tea. It was very refreshing. Along with us there were 2 more guests in the homestay - a lady from San Francisco who was staying here from a month and a lady from Italy who had also come last night much before we arrived. After taking some tips of what all to explore around from the SF lady, I went out to explore. I have something for villages and local people, so rather than going to the lake or the caves I decided to go explore the village first. Our homestay was around a kilometer's walk from the village. Walking through a well paved way with pea plantation on the sides followed by a narrow path through cardamom plantations took me to the village. Huts were mostly self made with bamboo, wood and straw with lots of potted plants mainly flowers in front. This is the place that you thought existed only in your dreams. Self made lovely little hut... Every hut looks different here. People seemed busy in their day to day chores. I could hardly see anyone. After some roaming around I met were two sweet young girls playing on a hammock and a young energetic guy playing guitar. When I stared talking to him I was surprised to know he knew that I came last night with 2 other friends and that we reached very late at night. He was genuinely interested to know if the climb was ok and we did not get very tired. It's a small village and everyone seem to know each other. The guys accompanying us in the night were related to him. Anyway after a quick introduction he took me to show around his place. I was amazed to see it. One wall had coins from all over the world stuck to it, another wall had pics of him and his family with foreigners, a world map, lots of travel guide books and hand made wind chimes hanging above the dining table. The pictures he told were taken by his guests and sent to him later by post, the wind chimes were also made by the guests and were presented to him as the parting gift. He insisted I check out his kitchen too. It was a small but very well organised modern kitchen and inside there was a traditional clay stove as well. little more talk and I got to know this is his homestay where he mostly get backpackers from all over the world. He is running it from past 15 years. And its mainly through the his traveller guests that he learns about the world. I visited the village again in the evening and went till the monastery. On my way back heard guitar playing in a room. went inside to seee some local youngsters playing guitar and singing. they were happy to have a guest joining in. There was no hesitation whatsoever. Another interesting character I met was an old man sitting by the window smiling at every passerby. He was in army and was posted at Dehradun before his retirement. Now he spends all his time in this small village with his family. Just in a day I got so attached to the people and the place, I surely would want to come back here for atleast a week. The next day was spent exploring the lake and caves. We had to down trek to the road to reach the lake. The lake is sacred for both Buddhists and Hindus and is believed to be a wish fulfilling lake. The local name for the lake is Sho Dzo Sho, which means "Oh Lady, Sit Here". The popularly known name of the lake is Khecheopalri Lake as its nestled in the midst of the Khechoedpaldri hill, which is also considered as a sacred hill. According to Buddhist belief the lake is the emanation of goddess Tara blessed by Guru Rempoche. Local folk tales say the lake got migrated from elsewhere and stayed in the valley which some of the then villagers saw it, therefore, they named the lake Chojoo “The lake that stayed” The miraculous part of the lake is that surface of the lake is clean in spite of it being surrounded by the thick forest. Leaves do fall on it sometimes but the birds fly in and instantly pick them away. On the other side in about one hour walk from the lake there is a holy cave. Best time to visit: The best months to visit are from September to May. How to reach: The lake is in West Sikkim and is147 kilometres from Gangtok and 32 kilometres from Pelling town. You can hire a cab from Pelling to reach the lake. There are no local buses but there are some shared jeeps that ply from Pelling and Geyzing once or twice a day. There is a walking track too from Pelling to this lake, which takes around 5 hours. Get in touch with ChaloLetsGo for customised trips if you want to explore Sikkim.